Flight Snack 03, originally uploaded by mattlach. This evening I read about a rather humourous decision handed down by the Canadian Transportation Agency regarding Air Canada’s accommodation of food allergy sufferers. There’s nothing intrinsically humourous about the decision itself, but it becomes funny when paired with Air Canada’s reaction to another class of allergy sufferers. 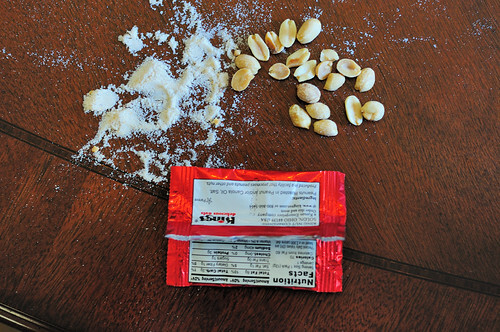 First, have a look at the precautions mandated for the nut-allergic. The airline has to provide a nut-free zone around the allergy sufferer, the scope of which depends on their class of ticket. For people in executive first class, the buffer zone will consist of the pod-seat occupied by the person with allergies. In North American business class seating, the buffer zone will consist of the bank of seats in which the allergic person is seated. In economy class, the buffer zone will consist of the bank of seats in which the allergic person is seated as well as the banks of seats directly in front of and behind the person. People who wish to receive special accommodation should notify the airline within 48 hours of their flights, the ruling said. — McGinn, Dave. “Air Canada told to create nut-free buffer zones.” Globe & Mail, 19 October 2010. As with all things in life, though, some special accommodations are more special than others. If you’re at risk of anaphylaxis due to contact with nut oils and particles, you get a nut-free buffer zone that the airline is responsible for policing. If you’re at risk of anaphylaxis due to contact with animal dander and saliva, you get no buffer zone, and it’s up to you to make sure you don’t get stuck somewhere where your allergens might be present. VANCOUVER — Air Canada is standing firm on its new policy to allow cats and small dogs to travel in passenger cabins, despite health concerns from people who suffer from pet allergies. …”We believe our policy is prudent,” [Air Canada spokeswoman Angela] Mah said. On its website, Air Canada says it is sensitive to the concerns of allergy sufferers and asks that travellers with pet allergies advise a check-in agent of their allergy to ensure they are not seated next to a customer with a dog or cat. If you’re curious, as I am, about how many people might be afflicted with nut allergies versus pet-allergies, there’s some baseline data in this Globe & Mail article. It states that the first-ever nationwide study (published in the Journal of Allergy and Clinical Immunology) indicates that 2.5 million Canadians—or 7.5 percent of the population—have food allergies. Specifically, 1.93% have peanut allergies, and 2.36% have tree nut allergies, for a grand total of 4.29% of the Canadian population (or roughly 1.46 million people). And what about pet allergies? That’s harder to nail down, but this editorial in the Canadian Medical Association Journal cites a figure of one in ten people. If we took that to mean ten percent of the Canadian population, that would be 3.4 million souls, or more than twice as many pet-allergic people as there are nut-allergic people. Yet the pet-allergic are responsible for policing themselves, while the nut-allergic get to have the airline do it for them. …Seating passengers with allergies away from pets is not a realistic alternative. Pet dander remains on seats long after the pet and its owner have gone. One study identified clinically relevant concentrations of cat allergen on 100% of sampled airplane seats on domestic flights and 16% of seats on international flights [Martin IR, Wickens K, Patchett K, et al. Cat allergen levels in public places in New Zealand. N Z Med J 1998;111:356-8] Moreover, flights are usually filled to capacity, and airlines have not created mechanisms to facilitate last minute seat changes. In other words it’s purely a revenue consideration. Mapleflot will lose seats to Westjet if they don’t allow pets to travel in the passenger cabin. One hopes that either the Canadian Transportation Agency or Air Canada itself will recognise that differing standards and treatments for various classes of allergy sufferers will inevitably lead to a cavalcade of me-tooism from those treated unequally. That way lies madness. Either all allergy sufferers are responsible for policing their own health, or none of them are; it seems unwise and frankly incomprehensible to have a double standard of this sort. Real food, real wine glasses, real leg room. Sure, the low-bypass JT3C turbofans will make you deaf, but at least you’ll be comfortable on the way there. Three aircraft pass an Air India jet while at enroute altitude. Lest anyone think these are “close calls”, RVSM-equipped aircraft are permitted to operate with 1,000 foot vertical separation. If you’re wondering how the captain (this is being shot from the left seat, judging by the angle of the windows) knew to get his camera rolling in time to film this, the onboard TCAS system will display its targets overlaid onto the nav display/EHSI, so there is no mystery about where everyone is, relative to each other. I enjoyed this Toronto Star opinion piece on Porter Airlines’ upcoming IPO because it sheds some light on how certain industry analysts think, and that in turn colours how certain journalists think. “People aren’t as afraid of taking risk,” says Basili Alukos, an equity analyst at Morningstar Inc. in Chicago, who adds that there’s “appetite” for airline stocks, appetite being one of Mr. Porter’s favourite words. Alukos notes the recent loft in the share prices of even some debt-laden U.S. legacy air carriers. The story Deluce, a pilot and past-president of Canada 3000, will take to the street is the story of the still upstart airline stealing a march on the competition while keeping a lock on what is now called Billy Bishop Toronto City Airport. If Alukos is right – and I do believe he is – brand loyalty will be weakened, eventually, by price war. Mr. Porter’s adorableness will only take him so far. That one sentence tells you right away that the analyst does not comprehend Porter’s business model. Every airline is expensive to operate and generates relatively meagre profits, but almost all of them have refused to adapt their core processes to better reflect new realities of air travel. Low-cost carriers (LCCs) are frequently cited as factor in driving down fares, and that is a valid point. But LCCs alone do not explain air travel’s woes. The bottom line is that air travel has become inconvenient, unpleasant and inappropriately priced relative to the true cost of operating an aircraft. For example, a typical full-service airline will operate its aircraft to and from major hub airports, say from Pearson to LaGuardia, for example. These are both busy, expensive and frequently congested airports. The landing fees are expensive relative to smaller airports in the same metropolitan areas. Many airlines fly into these large hubs, and with greater numbers of aircraft comes greater complexity and opportunities for delays. A smaller airline such as Porter can avoid these potential hassles by choosing to fly into a less-congested airport (Newark, for example) near to the large hub. This allows the smaller carrier the possibility of cheaper landing fees, better on-time performance, fewer delays, quicker embarkation and disembarkation of passengers, and so on. Any airline could, in theory, switch hubs provided it negotiated appropriately with the relevant airport authority. But most of the large airlines are locked into large, expensive airfields because that is where their partner airlines and connecting flights meet, or their maintenance facilities are located, and so on. The genius of Porter lies in choosing airports which are close to the major cities they serve, but not as congested as the main international hubs. Having to wait in the Customs line behind 1200 people that just got off a trio of arriving 747s can put a bit of a damper in your day. There’s little chance of that happening when you fly into the airfields that Porter serves, and that’s a deliberate choice because they want better a better customer experience. Which leads me to the next point: Porter’s animating philosophy is business class for everyone. Or to be blunt, a more pleasant flying experience for everyone. Even if the airline’s competitors slash their fares, they will have to match Porter’s convenience and superior customer experience. The average Bay Street exec flying from Toronto to New York is not going to be wooed by a cheaper fare. Let us say that Air Canada Jazz begins operating its Dash 8-100s from CYTZ as they did in former days. The temptation for Jazz’s route structure will be to fly into a major international hub in New York where it can connect with Air Canada proper. Even if Jazz slashed its fare to just above TTC bus fare, it would not destroy Porter’s market share. Sure, a lot of people would give Jazz a shot, but they will soon realise that 1) the equipment is older and noisier, and 2) departure from YTZ might be faster, but extricating oneself from LaGuardia is still slow and painful due to large passenger volume. Students and cheapskates will be wooed by cheap fares; the suits on Bay Street and downtown dwellers in general—arguably Porter’s primary audience—will not. They will opt for a more pleasant and convenient experience even at a greater cost. Any airline that hopes to eat Porter’s lunch will have to provide a similar level of service and convenience, and that won’t be easy unless they adopt a similar business model (which will, in turn, mitigate against their price being significantly lower). Cheap fares are not the airline-killer; the real killer is cheap fares married to lousy product and great inconvenience. That, unfortunately, describes the bulk of air carriers today. RELATED: A Canadian Press report in the Star‘s business section gets it right. Analyst Robert Kokonis of travel consultancy Air Trav Inc. said considering Porter’s stellar reputation, that figure is not out of the question. He said the offering will generate a lot of excitement among investors because Porter offers a unique business model that focuses on customer service. “It’s going to ignite a lot of passion and a lot of people to hop on board, so I wouldn’t doubt if this issue becomes oversubscribed,” he said. — “Porter plans IPO.” Canadian Press/Toronto Star, 16 April 2010. Sort of sad that a “focus on customer service” is considered a unique selling point among airlines. But maybe that’s all you need to know about why Porter’s successful, and other island airport carriers (such as Air Canada Jazz) were not. Len, 767 captain and author of Views From The Left Seat, has crafted a pair of posts that amply illustrate some of the problems with Haiti’s aviation infrastructure. Haiti’s weak national government and longstanding social malaise are well-known and well-documented, but it is informative to see that the lack of rigour extends even into the highly disciplined arenas of air traffic control and airside management. The first, written on December 4th, 2009 (before the earthquake) paints a picture of what we in North America might generously call “relaxed” operational and security discipline. The climb up to FL 370 was uneventful. 600 miles later and approaching Haitian airspace, we said “goodbye” to Miami Center and gave Port Au Prince Control a call. Five more calls and they finally answered. Had they not answered we would have been forced to hold at the boundary of their airspace. Glad they answered since we had a small thunderstorm to contend with right along our route. While descending, we passed an opposite direction outbound airliner 1000 ft below us and wondered why we weren’t advised? A call to Approach Control about that went unanswered. …We parked, set the brakes and once the ground crew had positioned the boarding stairs, the cabin crew opened two cabin doors. Out flooded the passengers onto the ramp with wild abandon! They all knew where to go but it was almost comical to see so many unattended people on an airline ramp with absolutely no security concerns whatsoever! The second post, written on March 20th, 2010, illustrates what air traffic control services were like after the quake—and after Haiti’s own controllers took over from the combat controller services provided by the US Air Force. It was business as usual until we had to switch over to Port-au-Prince tower. Descending in, we were cleared for an ILS to runway 10 with a circle to land on runway 28. But we were only given a clearance to descend to 5000 ft and to report inbound on the ILS. OK fine…So we continued on in and reported inbound but the controller was apparently too busy or distracted to hear us. We kept calling until he finally answered us and asked where we were? “We’re overhead the field at 5000 ft” was our answer! He seemed surprised and promptly cleared us back to the initial approach fix and gave us instructions to hold and await further clearance. 20 minutes later he cleared us for the same approach and for us to call the field in sight and to enter a downwind for runway 28. So we did all that and set up for the landing. Meanwhile he cleared a Canadian Air Force C-17 to back-taxi for takeoff on runway 28. As we turned final, the tower amended the C-17’s enroute clearance which resulted in them not being ready for takeoff. With us now on short final and the C-17 still on the runway, we had to execute a go-around and get back in the pattern. So now we’re back on final and the tower has cleared the C-17 for takeoff. It all was looking good until the C-17 aborted their takeoff with some sort of mechanical issue. We had no choice….another go-around!! We broke off to the right and started a climb. Just then we received a traffic alert on our TCAS with instructions to “CLIMB, CLIMB”. I looked out and saw a Cessna Caravan doing a steep turn to avoid us as we were climbing and turning in the other direction. That was close! We asked the tower for instructions and all he could tell us was “go hold east of the airport somewhere”. He was completely flustered and not in control of his airspace. Now a clearance like that in the real world is just unheard of! We were clearly on our own this day. After several minutes of us circling low over the city, he told us to come on in and land. By then we had lost sight of the airport so we had to rely on some basic VFR skills and dead reckoning to re-acquire the airport. Now to be fair, aircraft convergence conflicts are not entirely uncommon. Close calls with little (or not forceful enough) warning from air traffic controllers can happen anywhere—in fact a similar incident involving a United Boeing 777 and an Aeronca 11AC occurred near KSFO on Saturday. Planes travel at hundreds of miles an hour, so you may have only seconds to identify that little dot at your 11 o clock before it ends up in your lap. This is why large aircraft have onboard radar and TCAS systems, and smaller “pocket” versions (using transponder signals) are available for GA pilots. The more worrisome aspect is that the controllers (before the quake) were lackadaisical about answering calls from aircraft; this says something unkind about their professionalism even under ideal circumstances. In the “after the quake” situation, the controller got overwhelmed, lost the picture, and did not give proper radar vectors (i.e. “turn left heading 060, maintain 8,000, follow published missed approach procedure and hold”). That could have had disastrous and fatal results, especially if the converging aircraft lacked TCAS equipment. Fortunately, Len survived to blog about it; not every pilot is so lucky. The problem isn’t just that Haiti has lax standards, or even lax enforcement of rigorous standards (whether in aviation, building codes, or otherwise). As Publius at Gods of the Copybook Headings pointed out some months ago, Haiti had no economy to speak of, even before the quake. It is the poorest country in the Americas; with GDP per capita running at a paltry USD $1,300—or three and a half bucks per person, per day. Government corruption is rampant, which lead the United States (among others) to end aid in 2000. The BBC reported in 2004 that “that some 70% of assistance [to Haiti] found its way into the pockets of corrupt officials”. It’s important to note that without foreign aid, the government of Haiti would literally cease to function. Haitians themselves need to understand how institutionalised corruption (and social tolerance of it) retards their country’s economic and social prospects; if they cannot bring about significant political reform, all the money in the world cannot drag their country out of entropy and into modernity. RELATED: Robert Kiltgaard of AEI offers a prescription for tackling corruption in Haiti’s government.